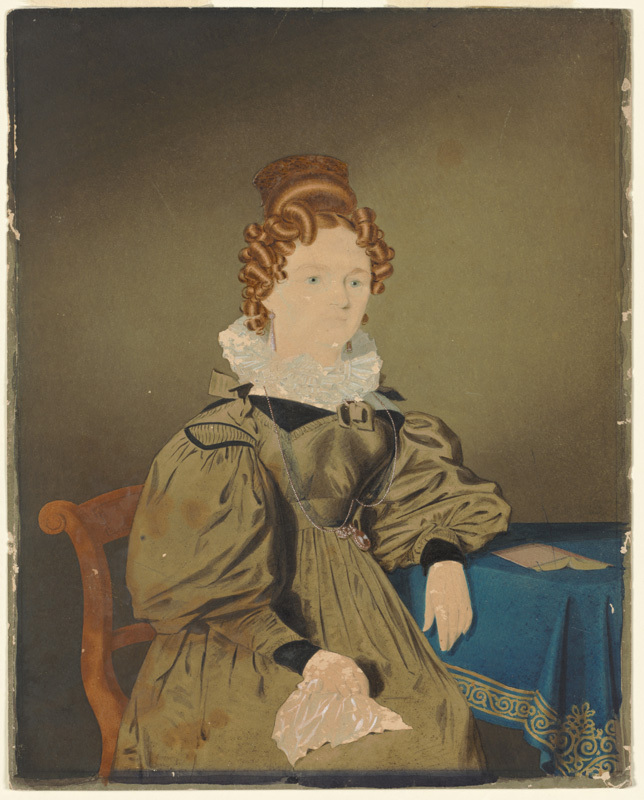 This right facing, ¾ length, portrait shows a young woman posed in a domestic setting seated on a tablet-backed [cedar] side chair with scroll supports (probably of colonial manufacture), holding a handkerchief in her right hand on her lap, her left arm resting next to an open book laid face down on a square-cornered table with a blue [felt] cover decoratively bordered with braid. Mrs Cooper’s elegant day dress appears to be made of fine [silk] taffeta in a light olive green colour. It has a high, closed neckline, in-filled with a white muslin habit shirt, or ‘chemisette’, with a [white-work embroidered] double-ruff at the neck, above a flat, turn-back, notched/triangular contrasting collar in black, edged with a narrow pleated olive-green band, with black and olive bows at the centre of the corsage and on the shoulders, over the smooth-fitting bodice above a full skirt, set into the round waistband seam with pleats, at the slightly-raised waistline. Following the fashionably wide-shouldered silhouette of the period, panels of gauging (tucks) at the sleeve head, edged with black piping, form large ‘bouffant’ (puffed) ‘gigot’ (leg of mutton) or balloon sleeves above the elbow, fitted tightly along the forearms above contrast turn back cuffs in black with olive-green pleated trim. Her red hair is elaborately arranged with large ‘bows’, or ‘sausage’ curls set in horizontal rows, either side of a centre-parting and drawn back into a high bun at the crown fixed with [tortoiseshell] comb. She also wears a small square brooch, pinned to the centre of her corsage, pendant [filigree-work] earrings and a long watch chain, looped up at the waist and suspending a watch with several fobs including a seal. 1. Sarah May (1802-1863) married in Robert Cooper Snr (the distiller) of Juniper Hall, South Head Rd, in 1822 and was his third wife. 2. Charlotte (aged 32) wife of Henry Cooper, architect, Darling Harbour. 3. Mrs Mary Cooper owned and let a house in Cumberland St.
By 1833 there may have been others: Mrs Thomas Cooper, mother of Sir Daniel, arrived by George Canning on Dec. 23 1828; in 1830 Miss Catherine Newell Rutter (1811-1860) married Robert Cooper Jnr, by 1833 she was aged 22 and between pregnancies: Robert III (1830), Charlotte (1832), William O (1835). She later married Thomas Chapman, widower of her sister-in-law Charlotte Cooper. Subject posed seated on side chair with left arm resting on table on which an open book is shown face down.